Architect: OMA with KHA Architects. 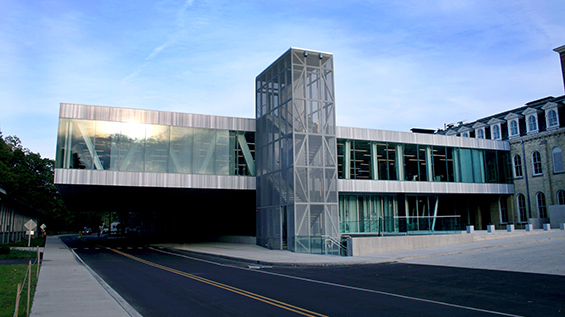 Milstein Hall, Cornell University, Ithaca, NY. Photo Credit: Silman, 2011. Structural engineer Nat Oppenheimer of Silman will present his work in a public lecture moderated by Paul Lewis. Nat Oppenheimer joined Silman in 1988 where he is now Executive Vice President. Founded in 1966, Silman has served as the structural engineering consultant on more than 21,000 projects. The firm values its collaborative working relationship with architects and focuses on structural engineering for both new construction and historic buildings. The firm has offices in New York, Washington, D.C., and Boston. Oppenheimer develops engineering systems to support new construction, renovations, and historic preservation and is Principal in Charge of much of the firm’s institutional work, which includes some of the most significant American cultural centers of the last decade. Recent projects include Grace Farms designed by SANAA in New Canaan, CT, the expansion and renovation of the Harvard Art Museums, and the Whitney Museum of American Art, both designed by Renzo Piano Building Workshop. For Cornell University, Oppenheimer worked with OMA to engineer the College for Architecture, Art and Planning’s Milstein Hall, which features a distinctive horizontal plate that cantilevers over one of the University’s main thoroughfares. Oppenheimer is currently working on the expansion of the Kennedy Center in Washington, D.C. by Steven Holl Architects. Currently teaching at Princeton University, Oppenheimer has been an invited jury critic for the architecture schools at Rice University, The New School’s Parsons School of Design, and the University of Michigan. He has also taught at the Columbia Graduate School of Architecture, Planning, and Preservation and at Parsons School of Design. He participated in the engineering of the BIG-designed 40th Police Precinct in New York, which won a 2016 New York City Public Design Commission Award for Excellence in Design. Oppenheimer serves as a Vice-President on The Architectural League’s Board of Directors. Paul Lewis is a principal of LTL Architects and Associate Professor at Princeton University School of Architecture, where he serves as Director of Graduate Studies.